Curling may not be the most popular Winter Olympic sports but it looks set to gain a whole new fan base thanks to a very glamorous competitor who has been wowing fans on Twitter. 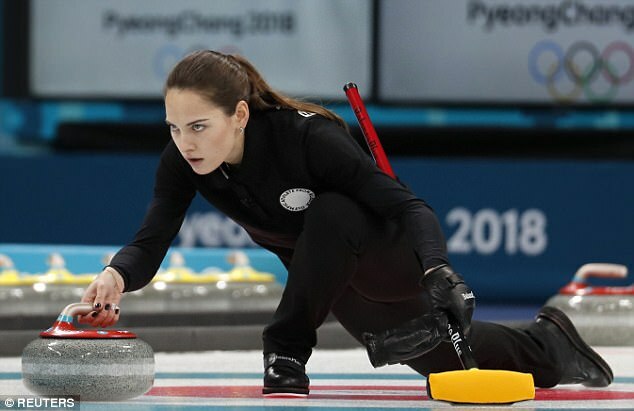 Russian curler Anastasia Bryzgalova, 25, has set pulses racing among viewers who are glued to proceedings in Pyeongchang who have been impressed not only by her prowess on the ice but her piercing stare, which makes her look like 'she can burn holes in the sheet with her eyes'. Admirers on Twitter have compared her to some of the world's most beautiful women including Adriana Lima, Megan Fox and Angelina Jolie. The athlete married her curling partner Alexander Krushelnitskiy in June 2017 and the couple enjoyed a sun soaked honeymoon in Spain. The pair won the 2016 World Mixed Doubles Curling Championship in Karlstad, Sweden. Anastasia took up the sport in 2009 after being attracted by an advertisement for a curling club at an ice sports complex and has a master's degree from the Lesgaft National State University of Physical Education, Sport and Health. Away from the ice rink, the athlete hones her figure with weightlifting in the gym and volleyball, delighting Instagram fans with her bikini-clad snaps on Instagram. Although Russia is not officially competing in the Games in the wake of the nation's state-sponsored doping scandal. However, 168 evidently clean athletes are taking part under the banner of 'Olympic Athlete from Russia', wearing neutral colours. Mixed doubles curling is one of four new events in the 2018 Winter Olympics and was the first to kick off official competition last Thursday. Anastasia and Alexander were beaten in their first batch by siblings Becca and Matt Hamilton from the US and became visibly agitated with each other following some missed shots. There is a reason that white women are the standard of beauty all over the world. No others compare. BTW, you have copyright on that name, Jizzmo?